In a surreal/unreal place called “Pebble Town” live men, women, and children for whom such concepts as time and geographical location seem meaningless. “Frontier”, then, is quite the appropriate title, given that this particular word conjures up images of liminal spaces, unlimited possibilities, and mystery. A “frontier” is a place that nominally separates “civilization” from “wilderness,” and the knowable from the potentially-dangerous unknowable. At the “frontiers of knowledge,” for instance, we recognize the almost limitless possibilities that present themselves when a major breakthrough occurs. On the frontier, anything can happen, and through her dreamlike prose and seemingly effortless yet meaningful narrative meandering, Can Xue shows us what that might look like. As critics have said of Can Xue’s books before, readers need to give themselves over to her prose and move across her dreamscapes because this is the world that she has created for us and for her characters. It’s almost like floating around in a Marc Chagall painting, indefinitely. Time is a malleable thing in Frontier, since journeys and births and deaths don’t seem to follow the usual linear course. For instance, because Liujin is the first character we meet, it seems inevitable that she colors how we read the chapters that follow. Therefore, it took me many chapters before I realized that Can Xue had circled back to before Liujin’s birth to talk about how her parents first came to Pebble Town. Here there aren’t any “hold on, let’s rewind a bit here” or “thirty years earlier.” Rather, Liujin’s existence, as a “native” of this surreal town at the base of Snow Mountain flows easily into the story of how her parents first arrived there, drawn to it by a single, small ad in a newspaper. It’s the frontier, after all, so demarcations and start/end dates are somewhat futile. Uncertainty and endless wonder run through this novel, with certain characters asking questions to which they don’t seem to expect answers. An enchanted garden appears to some characters, but not others, and only at certain times. A gardener tends this magical area, but he’s basically inaccessible. The “director” of the Design Institute (whose ads drew some of the characters to Pebble Town) is a mysterious woman who has already died once and then been revived by the monologues of another itinerant character years before. You can glimpse references to heaven/hell/the river Styx here and there, as long as you keep your reading eye just out of focus. Is the director God? Are the people in Pebble Town dead? Is the garden Eden? Are the many references to the “long-life bird” (the albatross??) hints that the characters all carry around burdens that become their lives in this surreal place? I agree with Porochista Khakpour who writes in the introduction that this novel requires many re-readings before one can even hope to understand all of its different layers. 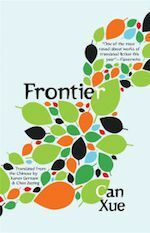 Frontier is certainly one of the most inventive, challenging books I’ve read in a while, and I look forward to reading more of Can Xue’s work.